A quiet start to the day - it is after all Sunday. A yoga session to the salute the sun and then plodding along getting stuff done. The first thing was to skim the cream off the milk and get the yogurt going. The cream was inoculated with culture to be turned into cultured butter tomorrow. We are starting to run down supplies of butter and in this case we were prepared to sacrifice the yogurt and make skim milk yogurt. I was pinching the cream from the drinking milk but Jean hates her tea with skim milk. The other option is skim milk fetta but we already did that and there are 4 pails I the cheese fridge. Next job was to scrub off the labels on some wine bottles and run them through the automatic steriliser (dishwasher). A full load of 12 for this run plus dishes. Our cattle needed their breakfast of sprouted Oats. It doesn't take long to empty the colanders into buckets, pour a little molasses over it, give the colanders a rinse, empty yesterday's soaking into the colanders and give the soaked grain a quick rinse. Fill two more buckets with fresh grain and add water. They love their breakfast Oats and wash it down with a small biscuit of Lucerne. Time then to check on our bees. Still scope for more honey in the super so no need to rob. They look healthy and busy. 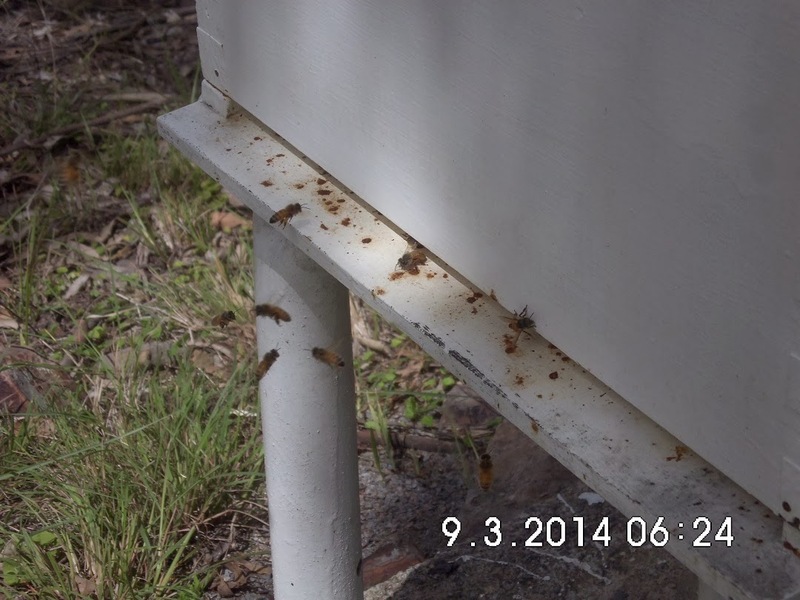 There was no sign of Small Hive Beetle up top and the base board trap didn't have any fresh activity. I cleaned the access slots for the trap but I'd better have a closer look at the hive next week when there is some more time. It was time to take some barrel (demijohn) samples of the 2014 wine for tasting. We will do this with our meals over the next week. The wine has barely finished fermenting but because of the extended post fermentation maceration the tannins have softened. The tannins are still quite distinct but the wine at this point contains the maximum health giving benefits. A small glass with every meal being beneficial. Over time the wine will soften but consequently begin to lose some of its goodness. The colour of all these wines is inky black. The down side of taking samples is that there are more containers to clean afterwards. While I was out in the Cave enjoying my winemaking hobby, Jean was in the kitchen slaving over a hot oven making Karithopita for morning tea. Morning tea today was at 2pm. Oh, that Greek thing is Walnut Syrup cake served with Cinnamon and yogurt. We finished the day off with some yard work i.e. whipper snipping the last of the garden bed edges and harvesting some dried beans - yet to be shelled. A cucumber turned up in the Tomato bed which added well to the green salad. A nice sized zucchini was BBQed along with the onions and mains. A pleasant dinner for two. We celebrated the day with a wine tasting.